From the outside, it looks like one of a zillion unassuming liquor stores found all over the South Bay in tired strip malls. Venture inside the Cask and Flask #1 and you'll quickly realize you've stumbled upon one of the finest beer bottle shops in all of the Bay Area. Their selection ranges from a wide mix from Northern California's breweries, far away notable domestic craft beers from places like Massachusetts's Clown Shoes and Oklahoma's Prairie Artisan Ales, and plenty of fantastic European imports. Somehow these examples of the world's finest brewing coalesced at the Cask and Flask which, from the looks of it, has little more to offer than a 40 ouncer of cheap malt liquor. Located at the corner of Leigh and Camden Avenues in San Jose's Cambrian neighborhood, I actually lived a block away from the Cask & Flask eight years ago. I was going through my divorce and desperately needed a place to stay. Any place where my ex-wife wasn't around to fight would do. I saw an ad for a room specifying among other things, "No Republicans". Since politics was one of numerous things my ex-wife and I either argued about or avoided talking about altogether, it seemed like a promising place to escape. The room turned about to be in a house owned by a quiet, slightly unkempt man in his fifties named Eric. Eric was into New Age music and wrote books on astrology. He requested my birth date, down to the exact minute, to make an astrological forecast to see if I would be a compatible tenant in his house. I suspect the two month's rent I paid him without hesitation during our first meeting helped the planets align in my favor, and I quickly passed his celestial background check. Eric's place was a bit weather beaten and smelled a little funky, but served as a good refuge during those turbulent times. Calming New Age music constantly emanated at all hours from the closed door of his room. Eric let me keep few things in his fridge, but initially prohibited any alcohol. Over time, he began to relent on this restriction after polite requests to store a few beers in his fridge, most likely because I paid my rent on time. Eric told me "I don't want to tell people how to live their lives, but I don't want any drunks in my house". Figuring this meant I could keep a few beers in his fridge, some nights I'd walk down to the Cask and Flask and pick up a six-pack of something. I wasn't into craft beer back then, so it was usually Miller Genuine Draft, Rolling Rock, or Gordon-Biersch when I got bit wild and crazy. I certainly don't remember many imports or odd bottles from breweries I never heard of at the Cask & Flask back in those days. They just had the standard brews you could find anywhere. After a living there for a little more than a year, I finally informed Eric I was moving out. Telling him his home was "a place of healing" during a difficult time in my life as handed him my last rent check, deep down I was dying to find my own place. A place where I could blast The Ramones from my stereo and stock up my own fridge with as much beer as I wanted. And besides, some of my best friends are Republicans. So I moved into a small studio apartment, and among other things, began to discover the endless variety and possibilities of craft beer. I stopped settling for the unsatisfactory and life has gotten a lot better since. For the first time in my life since I moved last fall, there's a brewery within short walk from my home. It's Campbell Brewing, which brews up beers for the Sonoma Chicken Coop restaurant, a major fixture in Campbell's lively downtown scene. While I've enjoyed many solid Campbell Brewing beers such as their Bitter, Scottish Ale and IPA, none of them caused the "slap-me-upside-the-head-and-make-me-say-Wow!" reaction required for Beer of the Month status. That all changed last week when I tried Campbell Brewing's Porter, a beer not usually found in their regular rotation. The humble Porter is one of my favorite styles, and this one ranks up there with the best I've had. It was smooth, flavorful, smokey with bitter chocolate flavors that all really popped. It was a little on the thin side for the style, with no noticeable hop presence to speak of. But if you ask me, these attributes actually worked to the advantage of this brew, which was all easy drinking roasty goodness. I've said it before and I'll say it again, South Bay breweries are underrated. And thankfully, one of those South Bay breweries making some great beer is a short walk from my new home. Now that I started incorporating "Cool Impossible" author Eric Orton's Eric Orton's strength and form exercises into my training, would it take my running to the "Cool Impossible" heights Orton describes that previously I could only dream about? I was about to find out in the Miles for Migraines 10k. Since running the Santa Cruz Half-Marathon last April, I started focusing more on strength and speed training while lowering my mileage slightly. In addition adding Orton's exercises into my regimen, I started doing weekly track workouts Tuesday mornings. They were pretty standard workouts of 2-3 miles through a combination of 800's and 1600's on a nearby track. Six weeks after the San Cruz Half-Marathon, it was time to toe the line for the Miles to Migraine 10k and put that training to the test. The race started in a dusty parking lot next to The Shoreline Amphitheater, with pleasant breezes from nearby San Francisco Bay keeping things cool. The field was small, maybe a couple hundred people, and we quickly spread out into small groups on the gravel road before reaching the Steven's Creek Trail at the other end of the vast parking lot. Looking down at my Garmin watch half-way through this section, I was pleased to see my watch indicating I was running at a 6:10 per mile pace. All indications from the last six weeks of training indicated my fitness level was in the 6:00-6:15 range for 10k, so I was right on pace. All I could think to do was hang on, and we came through the second mile in 5:54, which felt pretty manageable. And then, I noticed his breathing sounded shorter, as he was noticeably taking more gasping breaths. It sounded like he was in trouble. I was feeling fine and began wondering, "Could I actually win this thing?" I pushed to the lead, pulling away and he continued to gasp away, coming through mile 3 at a 5:44 mile. "That wasn't so bad," I was thinking, "Just keep at it and pull away from this guy." Of course, you might be thinking running three miles well under my target pace would come back to bite me. And you'd be right. It soon became clear I was the guy in trouble and the guy behind me, gasping or no gasping, was doing just fine. He quickly reeled me back in while I labored the next mile at 6:25. Then he literally dusted me on a dirt trail section of the course on the and I fell further and further behind. 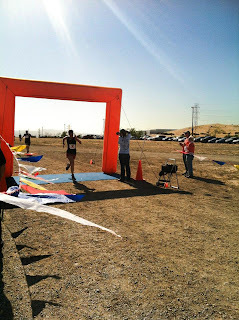 Miles 5 and 6 were both around 6:25 pace, and a finished in 2nd place in a time of 38:31. According to my Garmin watch, the course was actually 6.28 miles, equivalent to a 38:05 10k effort. Easily my fastest 10k in over 3 years. I'd have to say this race proved my fitness was a lot better than my decision making. Sub-six minute pace never felt so easy in a long time, but there was no reason to push the pace so early in the race. More patience, and I probably could have hung on for another couple miles around 6:00 pace. Sure, the leader sounded like he was in trouble, but if he was in trouble in mile 3, he would be in even more trouble at mile 4 or 5 if I had just patiently waited until then to make a decisive move. Lesson learned. So while this race turned out not to be some dreamy "Coo lImpossible" accomplishment, I'd say all that hard work in the last six weeks paid off. And hey, for finishing in 2nd place, I won a bottle of wine. Almost as good as a beer. Lance is getting a second chance. Lance Rice has an unusual gift. He pick out one can among the thousands he's collected in the past forty years and chances are, he can tell you exact date he found the can and everything about the day he found it. Mention a brewery, and it's a good bet Lance can recite its entire history. Give Lance a beer, and after a few sips, he can tell you what ingredients were used in the beer, and how it was brewed, despite never took any Beer Judging or Cicerone exams. Aaron Rice, Lance's nephew embarked on a Kickstarter campaign to create a film about Lance's talents and give him the opportunity to visit the breweries he has long talked about. Aaron calls his yet to be produced film "Lance's Brewery Tour". In his first attempt with Kickstarter, Aaron attempted to raise an audacious sum of $130,000 but fell well short of this goal. Never the less, his project got the attention of news outlets as diversion as MAXIM Magazine, The Cleveland Plain Dealer, USA Today, and Disney's Babble.com. Several breweries including Miller Coors, Pabst, Yuengling, Great Lakes Brewing Co, Rogue, Pittsburgh Brewing Co, New Holland, New Belgium, Spoetzl Brewery (Shiner), Schlafly, Boston Beer Company (Sam Adams) invited Lance to visit their breweries. Maybe "Lance's Brewery Tour" resonated with so many people is because it viewed Lance's autism something to be celebrated rather than pitied. It's something I've come to terms with raising my autistic son Brandon. At first, autism seemed like some demon to be exorcised from my son's brain. While helping Brandon overcome his mental deficits is rewarding, over time I learned loving my son meant loving autism. Make no mistake, Lance's autism isn't a blessing. Simply talking to someone else is a challenge for Lance. He's battled many phobias in his life. Loud, bustling places like breweries make him extremely uncomfortable. Autism is thought to disrupt the brains ability to manage sensory information. Thus, quiet rooms with a few people chatting away are transformed into a chaotic, crowded places full of loud noises and strobe lights in the mind of the autistic. Lance may find a certain structure and order by focusing focusing on the endless variations within the world of beer to reach a comfort level he rarely finds elsewhere. Perhaps the most extraordinary development in this film is that Lance is beginning to open up to world that's become more accepting of him. As Aaron Rice describes on the project's website, "Lance has autism and has always struggled with social anxiety. When Lance's Brewery Tour began people started calling Lance an inspiration, a hero and a genius and something miraculous happened - for the first time in 55 years Lance opened up to world! It's amazing what can happen when we choose to see people for their beauty and not their limitations." Encouraged by the initial response, Aaron relaunched a new Kickstarter effort for his film with the more modest goal of raising $15,000 for the film. If all goes well, Lance will start visiting the breweries that were mere abstractions in his mind this June 15th. I've pledged my support for Lance's Brewery Tour and hope you'll agree that Lance's story needs to be told and support this project too. 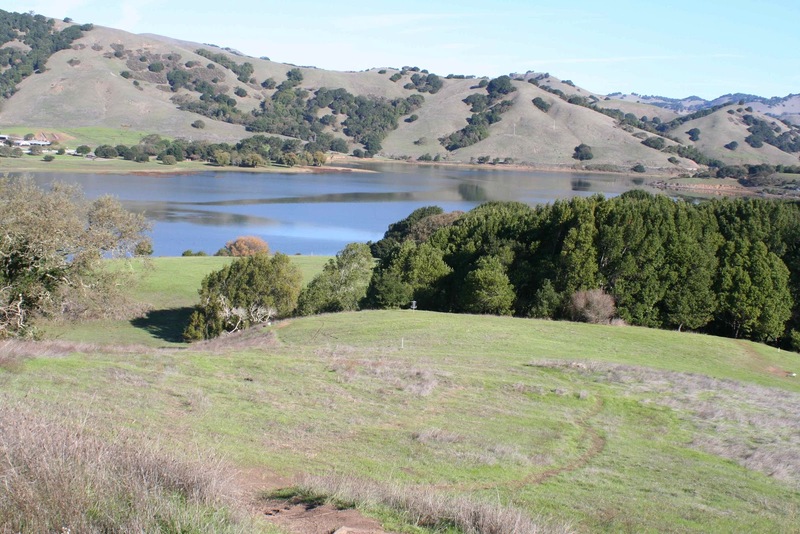 The folks at the California Beer Festival have generously provided two tickets to give away to their June 29th festival being held in Novato's Stafford Lake Park. Featuring over 70 beers from a great looking list of breweries, music and a barbecue cook-off in a picturesque Marin County setting, it looks to be a great day of beer and good times. For those wanting to attend this festival but either don't win or decline to participate, you can still get $2 off the price of admission with coupon code CBFSD whne you buy your tickets here. Look forward to everyone's mind expanding Beer Haikus! Eric Orton is a man with big ideas. His training methods are revolutionary, he calls for radical dietary changes and he developed his own unique sports psychology. He describes this all in his new book, “The Cool Impossible”. It’s densely packed full of scientifically sound training ideas and inspirational messages. Orton’s writing flows in an engaging conversational style mimicking the way he coaches his many athletes. I doubt you’ll adopt everything he advocates in his book to your training. I didn’t. In fact, I’ll even go so far as to say I disagree with some of his approaches to training concepts. 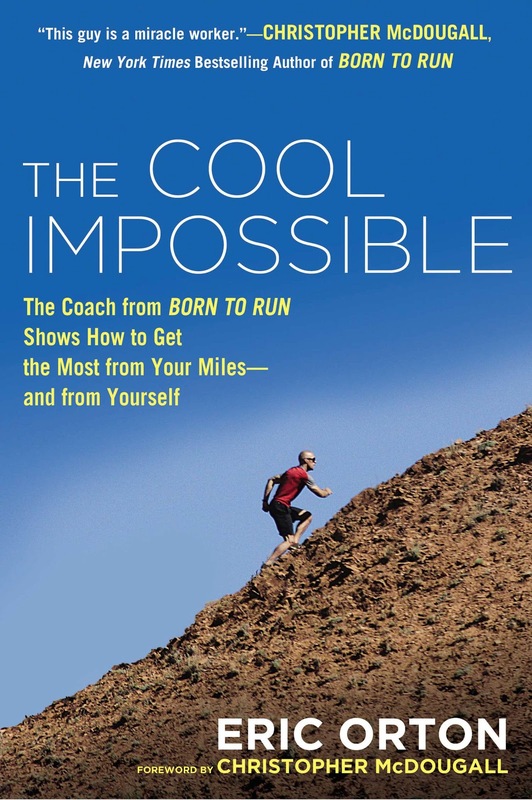 But one of the strengths of “The Cool Impossible” is that different runners will each find things they will use to reach new heights in running. And what is this “Cool Impossible”? Orton describes it as, “…getting back to daydreaming and creating the biggest, coolest fantasy we can think of to achieve.” While Orton claims this philosophy applies to all parts of our lives, his book focusses on achieving this “Cool Impossible” in running. Orton knows a thing a two about helping runners accomplish inconceivable goals. He transformed one Christopher McDougall from an injury prone runner who could only handle runs of a few miles to an ultra-marathoner who completed a 50 mile race in Mexico’s rugged Copper Canyon in just nine months. McDougall’s book about this ultra-marathon in the land of the reclusive Tarahumara Indians, “Born to Run”, became the bible of the minimalist running movement. Declaring "running shoes may be the most destructive force to ever hit the human foot", McDougall inspired runners to toss off their heavily padded shoes for ones with thinner lightweight soles. Some ditched their shoes altogether and started running barefoot. Despite all the groovy New Age-like rhetoric on things like “awareness” and “flow”, Orton’s program is all about hard work, dedication and applied biomechanical science. He outlines a number of running drills and strengthening exercises designed to strengthen the legs and the core to help runners achieve better form. They can be done in your living room or backyard without much equipment. All you need is a wobble board, an inflatable exercise ball, and a simple apparatus Orton’s developed called a slant board. Ski poles, walking sticks or even cut off broomsticks are also used to help keep your balance for some of the exercises. I saw the results in my running within a week. Running I found myself zipping right through patches of uneven ground I used to wobble through off-balance. I can see why trail runners are particularly big fans of Orton’s training. As a forefoot striker, I tend to get more flat-footed towards the end of runs as fatigue set in. Gaining leg strength from Orton’s workouts, I found myself at the end of runs maintaining form and speed rather than stomping around over the last couple miles. And I recognized from photos in Orton’s book I wasn’t lifting my knees high enough and so consciously worked on getting higher knee action in my form. ﻿﻿Orton talks about visualizing yourself striding over “logs” while running to get proper knee lift. As you run faster, you should visualize yourself striding over bigger logs. I noticed during my runs I could use my knee lift as a “throttle” and just focus on adjusting my knee height to control my speed. It’s powerful to suddenly realize the possibility to run faster not by working the legs harder, but to use the mind to guide the body to make subtle changes in form. ﻿﻿﻿Orton’s form and strengthening exercises are intended to supplement a nine-week “Strategic Running Foundation” training plan. The plan is individualized to each runner’s ability level using one mile time trial and a heart rate test. From this, Orton formulates no fewer than seven speed zones and seven heart rate zones individualized for each runner to follow in his training plan. If keeping track of all 14 zones seems rather complicated to you, you’re not alone. While Orton’s plan is based on sound science and I personally use a mix of running speeds to train, I found Orton’s plan way more complicated than necessary. The workouts are also written in a notation that’s hard to follow. I’m sure there’s some good workouts buried in there. Many of Orton's readers will wish he outlined his Strategic Running Foundation in a more straightforward, simplified and accessible manner. When it comes to food, Orton is not bashful about his opinions. He’s big on organic fruits and vegetables, and rails against all processed food that dominates our grocery store shelves. That includes pasta, a carbohydrate source most runners crave. When it comes to protein, he’s adamant about eating organic, free-range meats and wild caught fish with portion sizes no bigger than the palm of our hands. He even encourages us to take on a 20 day sugar detox, eliminating sugar completely from our diets. 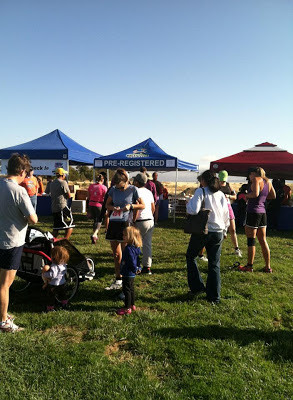 Orton goes so far as to suggest runners develop their own nutrition mission statement. I’m not planning on going on a 20 day sugar detox or writing a nutrition mission statement. But he has inspired me to make better decisions about what to eat. I resist the impulse to pick up that pack of M&M’s at the grocery store check-out line. I order a side salad instead of fries. And yes, when thirsty, I’ve started pouring a glass of water instead of automatically cracking open a beer. These are small decisions, but they add up to a larger dietary change. I’ve lost 5 pounds off my 185 pound frame in the last month as a result, the lightest I’ve been in years. I do feel better, too. After finishing Orton’s provocative book, I found myself thinking about things I wanted to accomplish in running. The last marathon I completed was the 1994 Boston Marathon nearly twenty years ago and I’ve always wanted to come back and run Boston again. The biggest thing that’s held me back is my body has broken down on runs long before I’ve completed anything close to 26.2 miles. I’ve spent a lot of effort correcting the imbalances and weakness that led to injuries. I saw a chiropractor four years ago to correct a hip imbalance that was causing all sorts of problems. That turned out to be a great investment, but I still had foot and knee problems limiting my longest runs to 10-12 miles. I discovered last fall my running shoes were a size too small, and now can complete runs of up to 15 miles without too much pain. When I ran the Boston Marathon in 1994, I really never embraced the whole Boston experience. I was nervous and uptight, ended up going out to fast and barely made it across the finish line. I wanted to come back and do the race over again, but the opportunity never came. Returning to Boston is something I’ve held in the back of my head, but it never seemed realistic given all the injury problems I’ve had. After reading “The Cool Impossible”, Boston doesn’t seem too far away anymore. For this month's Session, Chuck Lennati over at allbrews asks us to weigh in our thoughts on the success and failure of breweries. Which makes me think, maybe I should ditch my day job and become a Brewing Industry Consultant. After all, I do have plenty of qualifications for the job. I drink beer. I read about beer. I talk about beer. I write about beer. And every two or three months, I try to brew beer in my kitchen. Some might quibble with the fact I have no actual brewing industry experience to be brewery consultant. But when has something like that stopped any consultant from collecting a check? Or Sam Adams. Or Lagunitas. Or that great brewery just five miles down the road. Sneer all you want at Blue Moon, lots paying customers don't give a damn about contrived "crafty vs craft" debates and happily drink Blue Moon, so that's your competition, too. I still see new breweries positioning themselves against Budweiser and other light industrial lagers. Maybe that worked five years ago. The bar was raised considerable higher than that years ago. Despite the rising popularity of craft beer, I know of couple breweries that failed in the past couple years. In my opinion, the problem was they simply didn't see obvious problems of their business and correct them. 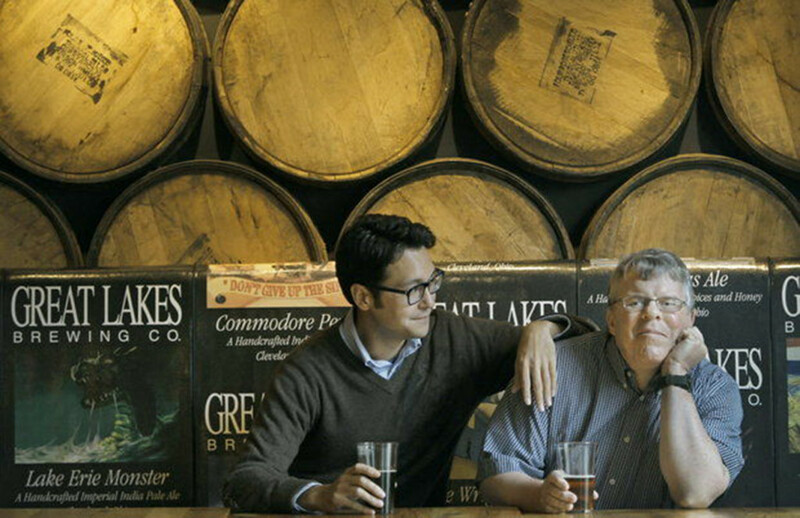 Mayfield, which specialized in high-end barrel aged beers, failed a couple years ago. I remember speaking with the owner a couple months before it all went south. He was a very smart man with a Ph.D. in Molecular Biology. He talked about deep subjects like "winery business models" and the historical context of his beer's sophisticated flavor profiles. There was just this small problem. He was charging a whopping $40 a bottle, over twice as much as barrel-aged offerings from well regarded breweries like Firestone-Walker and Russian River, and in some of his beers, those sophsticated flavors really clashed. Any 5th grader can tell you that's a recipe for disaster. And it was. Another brewery that failed recently was Buckbean Brewing from Reno, NV. I know less about this brewery than Mayfield, but they were relentless marketers and also aggressively expanded their distribution. They sponsored CanFest, a canned beer festival. When Buckbean closed, a lot of people speculated it was due to the rising costs of hops and grain, over-expansion, or other complicated industry factors. Actually, Buckbean's real problems were fundementally different than that. The beer sucked. I tried a four-pack of their red ale and was overpowered by phenolic off-flavors. Plenty of reviewers on RateBeer and Beer Advocate recognized the same problems. Apparently, lost in all of Buckbean's aggressive marketing is that the product has to be made competently for the marketing investments to pay off. I have to think that if Mayfield and Buckbean honestly recognized their problems and confronted them, they would be around today. Mayfield tried to intellectualize away a serious pricing issue. Buckbean seemed to sweep serious quality issues under the rug of marketing. The truth caught up with them. So perhaps my advice to anyone wanting to start a brewery, or any business for that matter, is look yourself very hard and honestly in the mirror.